Air Tahiti Nui has announced a planned deeper alliance with Air France on the Los Angeles-Paris CDG route and is rolling out a refurbished fleet of A340-300 aircraft to allow it to compete better with rival South Pacific carriers. But profits remain elusive for the heavily indebted carrier which survives with the support of its French Polynesian Government majority owner, which appears to be resisting a much needed restructuring of the airline. The far flung archipelago territory’s tourism industry is slowly recovering from the effects of the global financial crisis which saw visitor numbers fall more than 40%. But while French Polynesia is benefitting from growth in tourism from Australasians eager to venture beyond Fiji, the bigger spending European market remains in decline. Air Tahiti Nui is also facing tougher competition from a rejuvenating Air Pacific, as well as Hawaiian Airlines which has launched services to Australia and New Zealand. All provide connections to the United States and in the case of Hawaiian, as far afield as New York, making each an attractive option for an island stop-over. Air Tahiti Nui announced on 16-Apr-2013 a new alliance agreement with Air France to develop a joint codeshare agreement on the Paris CDG-Los Angeles route. The two carriers are the only direct competitors on the route and have sought approval for antitrust immunity for an alliance including a bilateral JV agreement that would allow them to coordinate their services between Paris and Los Angeles. The antitrust application will link Air Tahiti Nui to the existing antitrust immunised alliance between Air France, KLM, Delta and Alitalia to form the centrepiece of the proposed metal neutral alliance and revenue sharing on the Los Angeles-Paris route and for codesharing beyond Paris CDG. Air Tahiti Nui currently operates five times weekly from Los Angeles to Paris as an extension of its nine times weekly Papeete-Los Angeles services, including one codeshare service with Air France. Air Tahiti Nui chairman and CEO Etienne Howan said: "The joint schedules of Air France and Air Tahiti Nui will provide our customers with more frequencies between Los Angeles and Paris while also linking Air Tahiti Nui to the Air France network in Europe and expanding Air Tahiti Nui’s global reach by providing improved service to consumers travelling between Tahiti and Europe via Los Angeles”. Air Tahiti Nui operates a total of 18 international frequencies per week, increasing to 26 frequencies during the peak southern hemisphere winter period. In addition to 14 frequencies from Papeete to Los Angeles during the peak of which half will carry on to Paris CDG, Auckland will be serviced three times weekly and Tokyo Narita twice per week. The Auckland services connect to Sydney, Melbourne and Brisbane through a codeshare with Qantas which was expanded in Jun-2012. Previously Qantas codeshared on Air Tahiti Nui’s Auckland-Papeete-Los Angeles service. French Polynesia’s capital Papeete is served by six foreign carriers, including Air Caledonie International, Air France, Air New Zealand, Hawaiian Airlines and LAN Airlines, offering a total of 16 frequencies per week. In addition privately owned Air Tahiti provides domestic and regional services with a fleet of ATR72 and 42 aircraft. Air Tahiti Nui added another oneworld partner, American Airlines, as a codeshare partner in Aug-2012 with American placing its code on Air Tahiti Nui’s services between Papeete and Los Angeles. In return Air Tahiti Nui placed its code on American’s services from Los Angeles to 15 US cities including New York, San Francisco, Las Vegas, Chicago, Boston, Dallas/Fort Worth, Miami and Washington DC. The partnership has significantly increased Air Tahiti Nui’s profile in its biggest market. Air New Zealand also codeshares on two weekly Papeete-Los Angeles services. Japan Airlines has placed its code on Air Tahiti Nui’s Papeete-Tokyo services. Air Tahiti Nui deploys about 64% of its capacity to North America, with the remainder relatively evenly split between France, Japan and New Zealand. Air Tahiti Nui is majority owned by the French Polynesian Government. The airline was founded in 1996 and commenced flight operations in 1998. In 2003 Air Tahiti Nui doubled its fleet of A340-300s to four, allowing for rapid expansion of the key Papeete-Los Angeles-Paris route. But the carrier acts primarily in a role of tourism provider and has never been profitable according to a 2008 report by the Territorial Chamber of Accounts, accumulating XPF35.5 billion (USD383 million) of public support, even though Air Tahiti Nui managed to reduce its deficit in 2009 to XPF2.2 billion (USD23.7 million). 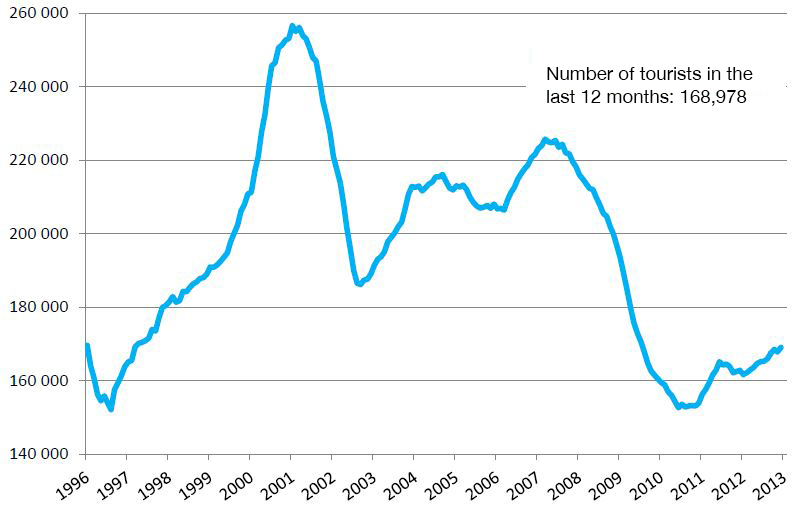 More recently, however the carrier has fallen on hard times as tourism demand collapsed following the global financial crisis and has been slow to recover since hitting a 14 year low point in 2010. Tourism accounts for about 25% of French Polynesia’s GDP, so there is clearly a perceived trade-off between underwriting the airline's losses and seeking to support the tourism industry. With Air Tahiti Nui facing bankruptcy, French Polynesia’s President, Oscar Temaru, in May-2011 called for all eligible workers in the territory help bail out the ailing carrier by voluntarily paying a third of their income into a rescue fund, as a “patriot action” required to keep the airline operating. 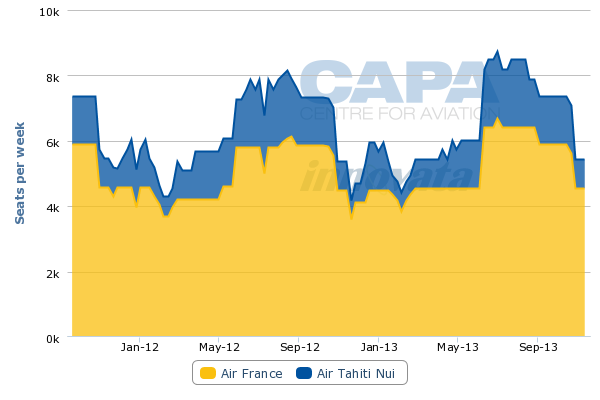 In Dec-2012 Air Tahiti Nui reduced its capital from XPF12.9 billion (USD139 million) to XPF1.6 billion (USD17.2 million). CEO Cedric Pastour resigned just a year into his tenure, falling victim to political interference over the Frenchman’s plans to divest one of the five A340s along with up to 100 staff to reduce capacity and costs. Mr Pastour, who founded Star Airlines (now XL Airways France) also intended to deal with the high number of free tickets issued by the airline, and practices such as free upgrades on board after the doors were closed. Free tickets accounted for up to 8% of seats, double the rate at competing airlines according to a Territorial Chamber of Accounts report. Mr Pastour was replaced by long-term government confidant and Air Tahiti Nui director Etienne Howan who has also been appointed chairman of the airline. Air Tahiti Nui was reportedly expected to make a XPF811 million (USD8.7 million) loss in 2011, doubling the loss reported in 2010. Since then little financial information on Air Tahiti Nui has been provided. Discussions to join the Air France-KLM-led SkyTeam marketing alliance or oneworld, which includes substantial codeshare partner American Airlines, have so far failed to yield a result. French Polynesia’s tourism is staging a gradual recovery, with overall growth of 3.7% in 2012, still about 25% below its previous peak in 2007 before the start of the GFC. But as is the case across the South Pacific, the tourism profile is undergoing a marked change with significant growth coming from some Asian markets, albeit off low bases, as well as Australasia. The United States remains French Polynesia’s biggest inbound market, accounting for nearly 31% of all 169,000 visitors in 2012 and recording 7% growth for that year. French tourists make up 21% of the market with nearly 36,000 arrivals in 2012, almost unchanged from 2011. In contrast Europe, excluding France, is weaker by about 6%. However, the biggest growth markets in 2012 were Australia, up 24% to 10,224, and New Zealand where numbers grew nearly 31% to 7,166. This growth is in part being driven by Australian and New Zealand residents increasingly exploring other Pacific island destinations for their mid-winter getaways beyond traditional markets, in particular Fiji. 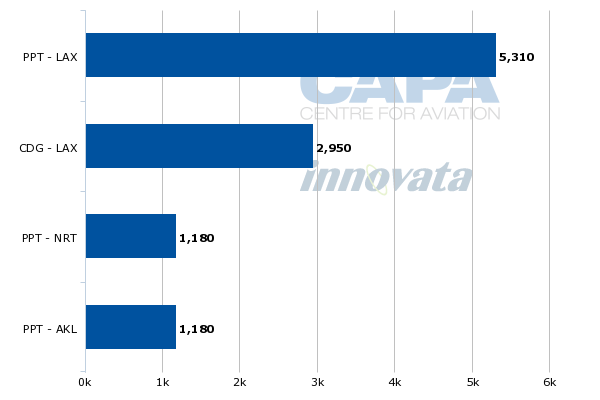 Capacity to Papeete from Auckland on both Air Tahiti Nui and Air NZ changed little in 2012, suggesting that load factors are increasing. The Asian market is proving volatile with increases of between 21% and 51% in north Asian markets such as China, Hong Kong, South Korea and Taiwan. But these are offset by equally large drops in other markets including Thailand, Philippines and Indonesia. Overall the Asian market grew just 3.3% to a total of 15,505 visitors in 2012. 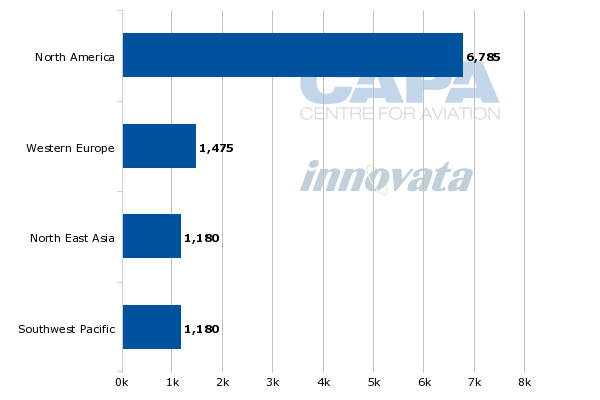 On the other side of the Pacific, South American visitors increased nearly 10% driven by Brazil and Argentina. Air Tahiti Nui introduced its first refurbished and reconfigured A340-300 in April-2013 on the Papeete-Los Angeles-Paris route. First class has been removed, allowing capacity in the business cabin to be increased from 24 seats to 32 angled lie-flat cocoon seats. The upgrade ensures Air Tahiti Nui can compete on product with Air Pacific which has also taken delivery of two of its three new A330-200 aircraft. Air Tahiti Nui, Air Pacific and Hawaiian Airlines are competing for passengers willing to include an island stop-over as part of a holiday to the United States and beyond. Air Tahiti Nui's expanded relationship with Air France should generate operating efficiencies and position the carrier to maximise the benefits from the important French market as well as any recovery in other European markets, as (or if) the eurozone emerges from its economic downturn. The improved inflight product will also help the carrier to compete around the Pacific Rim. However, given Air Tahiti Nui's previously weak revenue management record and the relatively high cost of operating the fuel-thirsty four engined A340s against aircraft like the twin engined A330s, there are still significant obstacles to surmount. Also, assuming Air Tahiti Nui's application to join to the elite North Atlantic metal neutral SkyTeam club is approved, key US partner American Airlines - a direct competitor, as part of the oneworld North Atlantic club - may be deterred from extending its cooperation. Given the recently increased reliance on the US market, this will be an important relationship to lock down. The leading US SkyTeam partner, Delta, despite a daily service to Australia and a half-hearted presence in Hawaii, shows little interest in the South Pacific, so may not offer a serious alternative should the need arise. But most of all the flag carrier will need to get its financial situation under control. This includes recapitalisation through private investment if it is to survive in the long term. For that to happen Air Tahiti Nui's government owner will have to bite the bullet and implement a thorough overhaul of the carrier without impediment. And an independent CEO, armed with the authority to drag the carrier into the competitive world of the 21st century. Gone are the days when governments can afford open-endedly to subsidise flag airline operations on the basis of undefined tourism goals, with no prospect of commercial survivability of the carrier. On the positive side, the carrier is managing to attract some of the high potential north Asian tourism market. But, as a French airline, with deeply French roots, the continuing central focus appears to be on stimulating a quiescent European market. That too may need to change.